Andy: With this rum’s very low alcohol content, it really shouldn’t taste the way it does. This is a cheap rum, and you clearly get what you pay for. Mixed with the pineapple juice it takes some of the harshness away, but with no alcohol content, what’s the point? It has a light pineapple taste, but tastes cheap, so watch out for hangovers. 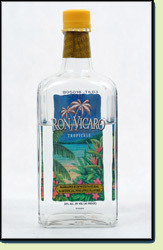 Adrian: Ron Vicaro Pineapple seems to have a decent flavor that is overshadowed by the poorly distilled alcohol. I’m not able to drink this straight, too much bite. Mixed with pineapple juice, I have decided there really is no point to it unless you are giving it as a gift to someone you don’t like. It now just tastes like watered down pineapple juice.